Cowboy Stadium is one of the premier venues in all of NCAA DI-FCS college football. While other stadiums may be bigger and feature more cutting edge amenities, “The Hole” offers a great family friendly atmosphere and regularly features a dominant on-field product. Located in Lake Charles, Louisiana and on the campus of McNeese State University, Cowboy Stadium serves as home field for McNeese State Cowboys football, a member of the Southland Conference. Constructed in 1965, Cowboy Stadium has received several major upgrades over the years, including the installation of the Sky Ranch, the three level suite and press box on the west side, and the Jack V. Doland Field House constructed in the north end zone. Cowboy Stadium is nicknamed The Hole because the playing field being built below the surface and surrounded on all sides. The stadium features a GeoMax2 artificial playing surface, a seating capacity of 17,410, and a video replay scoreboard. If you’re a fan of FCS level football or looking for family friendly sports entertainment, Cowboy Stadium is the place to be in Southwest Louisiana. Cowboy Stadium offers the expected stadium fare plus a few specialty items. For the typical stadium grub, Cowboy Stadium offers hot dogs ($3.50), hot links ($4.50), hamburgers ($4.50), and nachos ($3.50/$4.50). An assortment of snacks is offered as well including Cajun peanuts. Drink options are headlined by Coca-Cola products in a yellow souvenir style cup with the blue McNeese logo on it. Large drinks are $4.50 and small $2.50. Bottled Dasani water is $2.50. Be on the look out for the small red trailer inside both the west and east side concourses. This is where you’ll find our recommended concession item, a bowl of jambalaya for $4.50. They also offer a pulled pork sandwich. Other specialty stands feature fresh lemonade, Gatti’s pizza, and Kona Ice snow cones. Alcoholic beverages are not sold inside Cowboy Stadium and it is against stadium policy to bring in outside food or drinks. The atmosphere at Cowboy Stadium is a true strength of the overall experience. The stadium is known as “The Hole” because of its unique design where the field is built below the surface and bowled in with grandstands on the east and west, and grassy berm on the north and south sides. The addition of the Doland Field House in the north end zone has really made Cowboy Stadium a striking presence for fans once you settle into your seat. There’s no denying The Hole is one of the elite atmospheres in all of NCAA DI-FCS. The spirit squads and band add to the overall atmosphere. The Cowgirl Kickers, cheer team, and The Pride of McNeese band really help contribute to the overall college feel and do a great job with keeping fans engaged. Rowdy is very interactive, roaming the sidelines and mingling with fans along the grandstand wall. The student section, along with the home team sidelines, are located on the east side of the stadium. McNeese has several great game day traditions which make the overall atmosphere something really special for fans. Just before each game, the horse and rider statue in front of the Doland Field House ‘comes to life’ as a Mystery Rider, and his horse Moon Dancer, make the walk down Common Street and into Cowboy Stadium. The Lake Charles Buccaneers man the canon in the north end zone, which is fired after each score. The Mystery Rider makes a presence onto the field just before kick-off to rile Cowboy fans up. A few other traditions include the Parapokes, the strong tailgating tradition, and the cowbell. Cowboy Stadium is situated on the south side of the McNeese State University campus adjacent to the Cowboy Diamond and Track & Field Complex. McNeese State is located in the city of Lake Charles, Louisiana in the southwestern corner of the state, near the border with Texas. Lake Charles is a mid-sized city which thrives on the oil and gas industry, the gambling scene, and wildlife & fishery. While some restaurants are within walking distance of Cowboy Stadium, be sure to venture out and take in all of what this region has to offer. There are several restaurants to recommend while in town. Located just north of Cowboy Stadium is Mr. Bill’s Seafood Express. Don’t be alarmed on approach, the exterior doesn’t do the place justice. Stop in for some amazing fried seafood (definitely try the shrimp). Keeping in theme with Cajun cuisine, Darrell’s is further north of the campus near I-210 and is a great stop for drinks and poboys. The Darrell’s Special is a must and includes ham, turkey, and roast beef smothered in a roast beef gravy. If you don’t get your fill of seafood at Mr. Bill’s, be sure to check out Steamboat Bill’s. There are two locations in the area, but I prefer the one on the lake. This is a bit more of a sit-down and dine restaurant as compared to Bill’s and there’s some great boiled seafood on the menu. The Frosty Factory is a great place for a drink before or after the game. It’s centrally located off Common Street across from the stadium. You’ll find plenty to do in the Lake Charles area, depending on your preferences. The casino scene is a big draw with the L’Auberge du lac, Isle of Capri and Golden Nugget. Just outside of town you’ll find the Delta Downs horse racetrack. If you are looking for a chance to get outdoors, you’re definitely in the right place. The Adventure Trail just west of town over in the Sulphur area provides plenty of real estate for hunting, fishing, crabbing, sight seeing, hiking, and swimming at the beach. Stop by their office for a fun indoor walk through some of the sights you can expect to see while on the trail…the kids will enjoy it. There’s also seven area golf courses to enjoy. Both the L’Auberge and Isle of Capri casinos are also a great place to stay while in town as each also offers hotel services. Though it may pale in comparison to the size of FBS giants, the McNeese State fan base is strong, loyal, and proud, especially for an FCS program. The Cowboys have established a winning tradition in Lake Charles, and though they’ve traversed through a handful of down years recently, the McNeese faithful still show up in blue and gold for Saturday nights in The Hole. While attendance can vary depending on record and weekend opponent, expect to see between 12,000 -16,000 on hand at Cowboy Stadium. Average attendance typically has Cowboy Stadium around the top ten, which is good overall in the FCS, and by far the tops when compared to other in-state FCS programs. Speaking of rivals, there’s no doubt next door neighbor UL-Lafayette (located an hour east of town) is the team Lake Charles most loves to hate, however, their FBS status makes a trip to Cowboy Stadium unlikely in the current scheduling climate. Just across the state border is another regional rival in the Lamar Cardinals. Having recently reinstated football, the Cardinals and Cowboys have picked back up the rivalry in full force. Games with Northwestern State and Southeastern Louisiana are the next best attended. Fans are knowledgeable and engaged throughout the game. One of my favorite college football traditions is the playing of Joli Blon after Cowboy scores. Fans clap and sway together to this Cajun classic. And opponents learn to “Fear the Cowbell” as McNeese fans love to let their cowbells ring after scores or on big defensive stands. 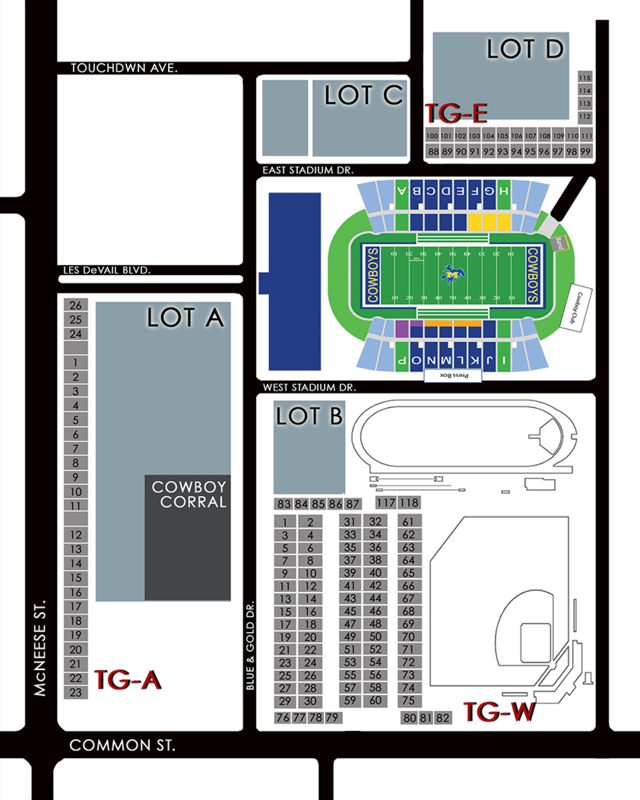 Cowboy Stadium is easily accessible off I-210 via I-10. There are several streets you can take to get from I-210 down to the stadium. The most commonly taken route is to exit I-210 onto Ryan Street, then take a left onto E. McNeese Street towards Common Street and the stadium area. If you view the parking map provided on the website (image below), keep in mind that these spots are reserved for season passes. You’ll find game day parking east of the Lot C in a grass lot. Plenty of fans also park on the McNeese State campus and make the half mile or so walk over to the stadium. If you arrive early enough, you may also find side street parking down Common Street next to the baseball field. To pick up or purchase tickets, head to the north side of the stadium to the Doland Field House. Will call tickets are available just inside the door and tickets can be purchased to the left of the doors at the ticket windows. Expect a quickly moving line in both areas. There are three primary entry points to Cowboy Stadium, the northwest gate, northeast gate and multiple smaller eastside gates centrally located under the east grandstand. Traffic moves smoothly regardless of which gate you choose, so grab the one closest to you. The concourses under both grandstands are wide enough to get around easily. You’ll notice a concourse inside the stadium that crosses each grandstand allowing fans to get up and down to their seats. The east and west sides are connected by a pathway in front of the Doland Field House. Restrooms are a little cramped, but you shouldn’t run into any major problems. Tickets start at $20 for general admission to Cowboy Stadium, with $30 for reserved seats. Personally, I recommend the general admission seats since all seats are regular bleacher style. However, keep in mind that will place you in the corners of both grandstands. Kids 4-12 get $5 admission and 13-17 are $10. Concession prices are reasonable and free parking is available if you don’t mind a short walk. Overall, the McNeese State football experience at Cowboy Stadium offers great value for the cost. – First and foremost, Cowboy football has an amazing tailgating scene for the size of the program and fan base. The RV lots on the west side are always jam-packed and there’s plenty of tailgating on the east side as well. Everywhere you look, you’ll see blue and gold McNeese tents and BBQ pits going. Cowboy fans are friendly and quick to invite visitors for a bite to eat. – One of the really neat traditions, among others, is the parachuting “McNeese Parapokes” during pregame. Since 2004, these rabid McNeese fans parachute onto the playing surface simply out of love for McNeese. It’s a great sight to see for the little ones in attendance, but really, fans of all ages enjoy watching the Parapokes descend onto the field. Here’s an article which talks a little more about the Parapokes. – The Buccaneers of Lake Charles are a local group which man the touchdown canon in the north end zone. While there seems to be somewhat of a mixed review on whether fans love or hate the canon, it is definitely one of those extra items that make the overall experience unique. The canon is loud (the video below doesn’t do the sound justice), so be sure to prepare yourself, and your kids, that it will be fired after every score, including extra points and field goals. – McNeese does a great job of memorializing past gridiron greats and championships. The concourse under both the east and west side are filled with pictures of former great Cowboy players. On the Doland Field House, you’ll notice a listing of McNeese’s many conference championships. – There’s plenty more to add here which has already been mentioned within the review. From the fans ringing their cowbells, to the Mystery Rider, and the playing of Joli Blon, the experience at Cowboy Stadium is much more than your typical FCS college football experience.